The man arm pillows, heated toilet seats, sushi bag covers … we’ve all heard of these bizarre, yet actually (kind of) useful items. And we secretly want all of them. Well, if Japan can make ingenious inventions for the bedroom and bathroom, there’s no reason why it can’t for the kitchen—and it did. 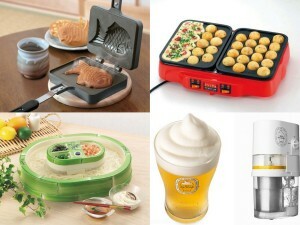 Here are some top must-have gadgets! Piping hot, delightfully gooey little spheres of batter mixed with bits of octopus, slathered in a savory and tangy sauce, and topped with bonito flakes … drool-inducing bliss—and that, ladies and gentlemen, is what Osaka’s beloved takoyaki (literally, “fried octopus”) is. Hungry? 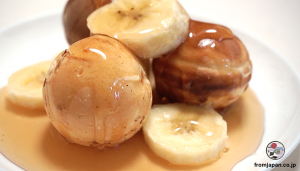 Well, it turns out you don’t have to be in Osaka (or even Japan) to fill up on these heavenly bite-size balls. That’s right, the Gods have gifted humanity with the electric takoyaki machine! Rejoice. All you have to do is plug it in, turn it on, and get cooking. Really, it’s that simple. In just minutes, you could be reliving that unforgettable moment you had in Osaka—with the added fun of poking and turning your own takoyaki. Don’t worry if you can’t get it perfectly round the first time; the great takoyaki Senseis didn’t master the art in one night, Little Grasshopper. For those of you concerned about the compatibility of the electricity plug and voltage, there’s also the takoyaki pan, which can be plopped right on top of the stove. These pans can whip up a serving or two faster than the electric machines—especially when used on a gas range. 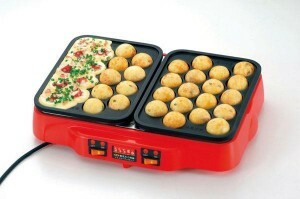 The takoyaki maker is a standard home appliance in Osaka (and other prefectures of Western Japan), but this groovy appliance isn’t as common. 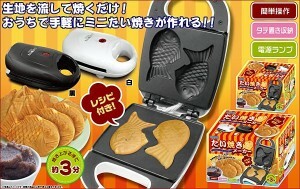 Presenting you the taiyaki (“grilled red snapper”) machine. 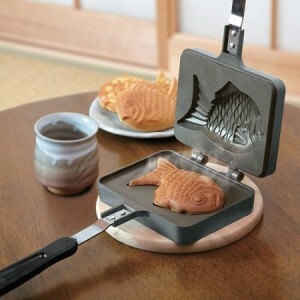 Taiyaki are hot, fish-shaped pancakes filled with sweet azuki (red bean) paste. The best ones are crispy on the outside and moist on the inside—and now you can make these delightful homemade fish pancakes from the comfort of your own kitchen (with or without pants on). 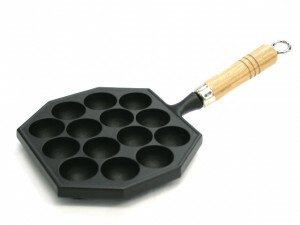 Like the takoyaki maker, for those living in areas that don’t support the 100V voltage, there’s always the taiyaki pan. These pans are self explanatory. Just plop it on the stove, fill it up and cook away. Remember to turn the pan halfway through for an evenly cooked little fishy. Read it exactly as it’s written: Na-ga-shi So-men. It’s a mouthful—of delicious somen noodles, that is! 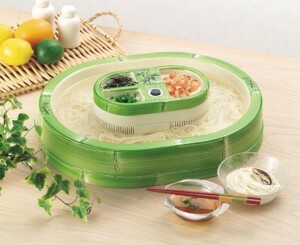 Somen are thin wheat noodles that are usually eaten cold during the hot summer months. In nagashi somen, small portions of somen are released down a slanted bamboo chute water slide. The fun part is that diners have to catch these noodles as they zoom by. There are several restaurants throughout Japan that offer this service during the summer, but for those living far away, there’s always the motorized home appliance version of it. No surprises there, right? This little nifty machine may not seem like a necessity, but it sure is during the muggy summers when you don’t feel like eating anything … unless they’re sliding down a giant slide or floating along in a lazy river. Caution: this requires some mad chopstick skills and excellent hand-eye coordination. Yes, frozen beer. There’s nothing like a mug of cold beer on a humid summer day … unless, of course, it’s a mug of super cold beer with frozen head on top. 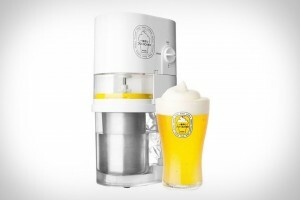 This Frozen Beer machine is, without a doubt, Kirin’s greatest invention yet. It’s battery-operated (C batteries), compact and portable, so you can showcase it on your minibar, bring it into your man cave or bust it out at any barbecue party. All you need is some table salt, ice and your favourite brewski, and within minutes you’ll have 600 ml (approximately 20 oz) of delicious beer slushie. 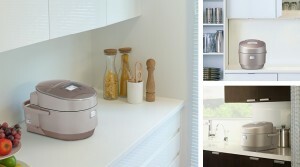 Simply calling it a “rice cooker” really doesn’t do these Japanese rice cookers justice. Because, yes, they cook rice, but they also do so much more. With a digital display that offers an elaborate menu of functions, this one machine is worth every penny you spend. You can set the timer so that your rice will be ready when you get home; bake a cake or a loaf of bread; and there’s also a setting for cooking brown rice. Once the rice is ready, the rice cooker will let you know by beeping and chiming pleasant little tunes. Rumor has it that the newest model of rice cookers even allows you to set how soft you want the rice to be. What?! It’s like you pay for a rice cooker, and get a little chef. 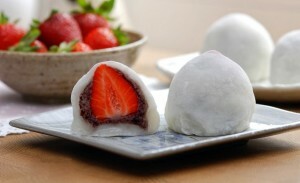 Mochi (rice cake) is a staple food in Japan. It can be a dessert or a meal, or whatever you want it to be. This handy-dandy mochi maker will produce freshly pounded rice cakes in less than an hour. All you have to do is pour in some glutinous rice (mochi rice), add water and press a button. Like every other Japanese appliance, these machines usually have more than one function. Some mochi makers can also prepare the dough for udon noodles and bread. Seriously, with all these amazing kitchen gadgets, it’s a mystery how the general populace stays so slim!